Superheterodyne is the most popular architecture used in communication transceivers. It is based on the heterodyne process of mixing an incoming signal with an offset frequency local oscillator (LO) in a nonlinear device to generate an intermediate frequency (IF) signal in the receiver or to produce an RF signal from its IF version in the transmitter. The nonlinear device executing the heterodyne process is called a frequency mixer or frequency converter. In a superheterodyne transceiver, the frequency translation processes may be performed more than once, and thus it may have multiple intermediate frequencies and multiple IF blocks. In a superheterodyne receiver, it usually contains three sections – the RF, IF, and BB. The RF section of the receiver includes part of the duplexer as the frequency preselector, a low noise amplifier (LNA), an RF band-pass filter (BPF), an RF amplifier as the preamplifier of the mixer, and an RF-to-IF down-converter (mixer). Following the down-converter is an IF amplifier (FA) and then an IF BPF for channel selection and suppressing unwanted mixing products. 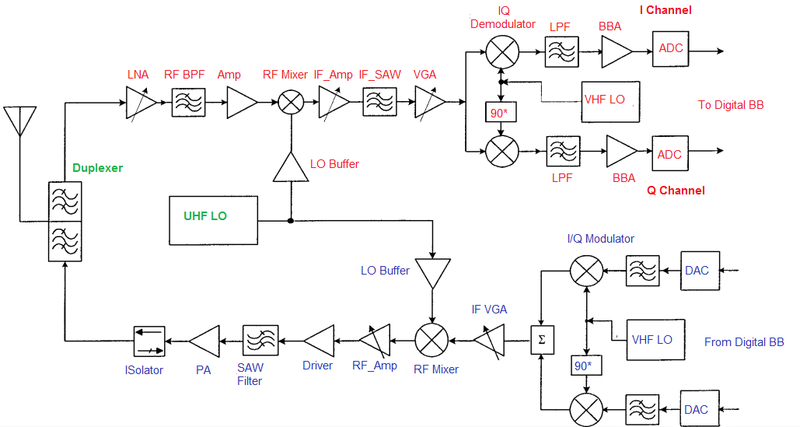 The I/Q demodulator is the second frequency converter, which down-converts the signal frequency from IF to BB. The demodulator contains two mixers, and it converts the IF signal into I and Q signals – i.e., two 90″ phase shifted BB signals. A low-pass filter (LPF) follows the mixer in I and Q each channel to filter out the unwanted mixing products and to farther suppress interferers. The filtered I and Q BB signals are amplified by BB amplifiers, and then the ADC converts the amplified BB signals into digital signals for further processing in the digital base-band. It is similar to the superheterodyne receiver that a superheterodyne transmitter also consists of BB, IF, and BB three sections. The gain control in the IF section probably occupies about 75% of the overall gain control range or more. It is rare to see that the gain control is implemented in the analog BB section for this radio architecture. The reason for this is that the BB section either in the receiver or in the transmitter has I and Q two channels, and it is hard to keep the I and Q channel magnitude imbalance within an allowable tolerance over the BB gain variation range. In the superheterodyne transceiver, most of the desired signal gain is provided by the IF blocks. At fixed intermediate frequencies, it is relatively easier to obtain high and stable gains. The power consumption for achieving high gain at IF is significantly lower than that if the same gain is developed at RF. It is necessary to have a good frequency plan for a superheterodyne transceiver to successfully operate over a specified frequency band. The sensitivity and linearity or the noise figure (NF) and IIP3, of a receiver are tightly dependent on the gain distribution over the receiver chain. To obtain a lower noise figure or a higher sensitivity receiver, it is preferred to make the front-end block from the antenna port through the LNA to the RF down-converter input port with a high gain. In this case, the receiver noise figure may be mainly determined by the front-end block noise figure, and the back section of the receiver chain from the down-converter input to the ADC output has minor impact on the overall noise figure. However, the high front-end gain will degrade the receiver linearity since the overall IIP3 of the receiver decreases with the front-end block gain increase. In receiver design, it is necessary to have proper gain distribution, which is able to take care of the tradeoff between sensitivity and linearity, or noise figure and IIP3, of the receiver for an appropriate performance. It is apparent that the same IF can be generated by an incoming signal with a frequency either above or below the LO frequency. Between these two frequencies, the one corresponding to the undesired signal is referred to as an image frequency, and the signal with this frequency is called as an image. The frequency difference between the desired signal and its image is twice the IF. To prevent the possible image interfering with the desired signal and other strong unwanted signals jamming the superheterodyne receiver, sufficient filtering before the frequency converter is usually needed. However, converting a high-frequency input signal to a very-low-frequency signal in just one conversion stage causes a problem: The image band will be very close in frequency to the actual RF input band. Thus, filtering these image frequencies becomes a challenge because of their close proximity to the actual RF input frequencies. A dual-conversion configuration can remedy this situation. Employing two frequency-conversion stages makes it possible to space the image frequency band further away from the actual input frequency band.The increased separation between the input frequency band and the image frequency band is due to the higher first-IF frequency. 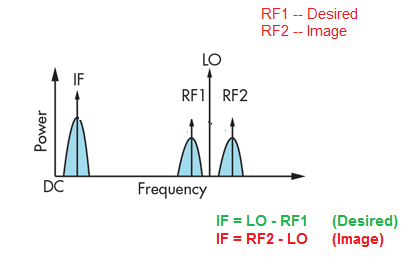 Converting the RF input frequency to this first-IF frequency allows the image frequency band to be further away when compared with the approach of converting the input frequency to the lower final output frequency directly. Consequently, the task of filtering the image frequencies becomes much easier. As stated, dual-conversion superheterodyne receivers have the benefit of a higher first-IF frequency, which allows them to achieve good image rejection. Furthermore, such receivers can also achieve excellent selectivity thanks to their lower second-IF frequency—greater selectivity is generally easier to obtain at lower frequencies. Thus, dual-conversion superheterodyne receivers can simultaneously achieve superior image rejection and selectivity. Superheterodyne receivers offer a number of benefits, such as the ability to achieve unmatched selectivity and sensitivity. They also are immune to the dc problems that occur in direct-conversion receivers. However, as mentioned, superheterodyne receivers have to cope with the image-frequency band. In addition, they are generally much larger in size because they require components like bulky filters.